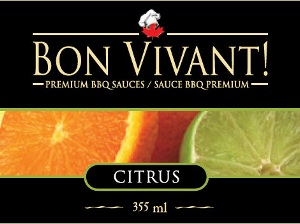 A tangy sweet barbecue sauce unified with orange, lime, and just the right balance of heat. This is a versatile sauce — use it on chicken, pork, whitefish, shrimp, salmon, ribs, hashbrowns, burgers, smokies, or as a dip. 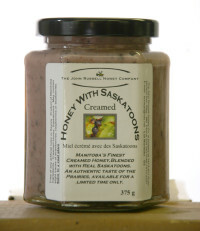 375 g John Russell's Creamed Clover Honey mixed with fresh Saskatoons grown throughout Manitoba and Saskatchewan. Saskatoons are also referred to as service berries, June berries, Shad berries or Indian Pear. They have a unique delicious taste that can be described best as a cross between blueberries and apples. Try some alone, or in tea. 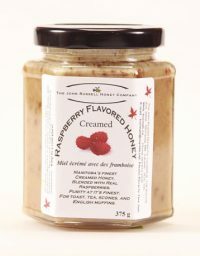 Great on toast and scones! 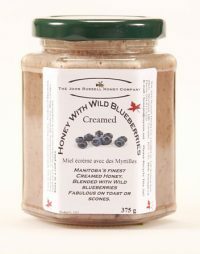 375 g We take the best honey in Manitoba and "cream" it by adding crystallized honey and gently stirring it until it reaches a butter like consistency. Then we add Wild Blueberries. Real ones! Picked seasonally in Northern Manitoba. No artificial flavoring and color is ever used. 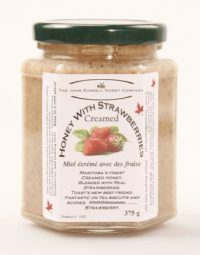 375 g We take the finest fresh strawberries grown in Manitoba and blend it with the best honey Manitoba has to offer, John Russell's Creamed Clover Honey. Healthy foods at their finest! Tastes great alone and goes well with everything you put it on. 375 g Manitoba has a plethora of wetlands in the Interlake district. These areas provide a wide variety of wetland flora, a variety that changes combinations yearly depending on rainfall and lake levels. 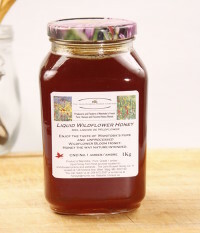 The result is a unique and slightly changing flavor amber class honey with more body and a complimenting taste to wherever it is used. 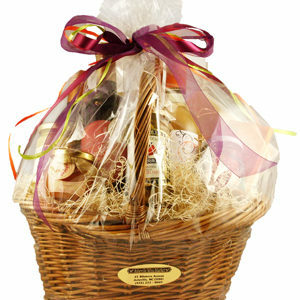 An assortment of delicious jams, honey, cheese, sauces, and dips all wrapped and ready to go for the holidays.